Slomškov Mill House is located in the peaceful village of Razkrižje set in one acre of grassland next to the Scavnica river, located in the north east of Slovenia, but only 300 metres from Croatia, 26km from Hungary and 37km from Austria, making it an ideal base from which to explore four countries in one holiday. Slomškov Mill built in 1901 and was one of the first fully automated water powered flour mills of its time. It was built and first owned by a bishop (Bishop Slomcek). In 1977 the Mill ceased from flour production and was abandoned. Since moving to Slovenia in 2005, I had cycled past the abandoned building many times and had thought that it would make a excellent base for my cycling business as well as a unique place for tourists to stay. Just by coincidence, in 2013, I learnt that the current owner, a British man, didn’t have the time to renovate the building and so I approached him with an offer to do it for him. For doing so, he made me a partner / owner of the building. In 2014 I began the mammoth task of renovating the building. I received huge support from the local Mayor and the National Heritage team who were pleased that the abandoned building was being brought back to life. All the original workings of the flour mill still remain to this day. 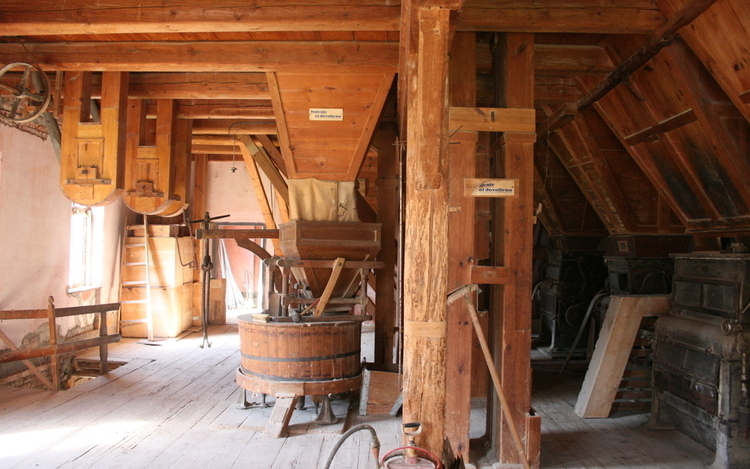 The Mill will always be a technical monument and a museum to the past for all to see. Adjoining the spectacular Slomškov Mill are the mill workers living quarters. In 2015 this space was completely renovated into two separate self catering suites for our tourist guests. Two suites have been created which can either be rented as separate accommodation or as one house to accommodate large parties.